In Brisbane, this type of heritage home enhances the city’s streetscapes. 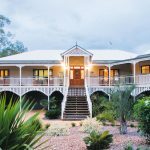 Century-old buildings are lovingly restored by owners aware of their superb aesthetic value and liveability in a sub-tropical climate. 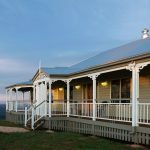 But buying an old home is not the only option for seekers of quality workmanship and historic excellence. 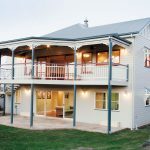 Garth Chapman’s Traditional Queenslanders provide all of these attributes in a home, with the added benefits of contemporary layouts, classic finishes and significantly reduced ongoing maintenance due to modern materials and construction techniques. 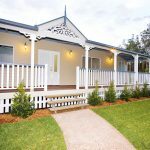 The Georgina by Garth Chapman Queenslanders would fit beautifully on a small frontage close to the city. 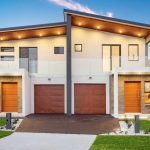 Instead of spending a fortune on renovating an existing house, with all the time and effort that it entails, homeowners can knock down and rebuild with ease. 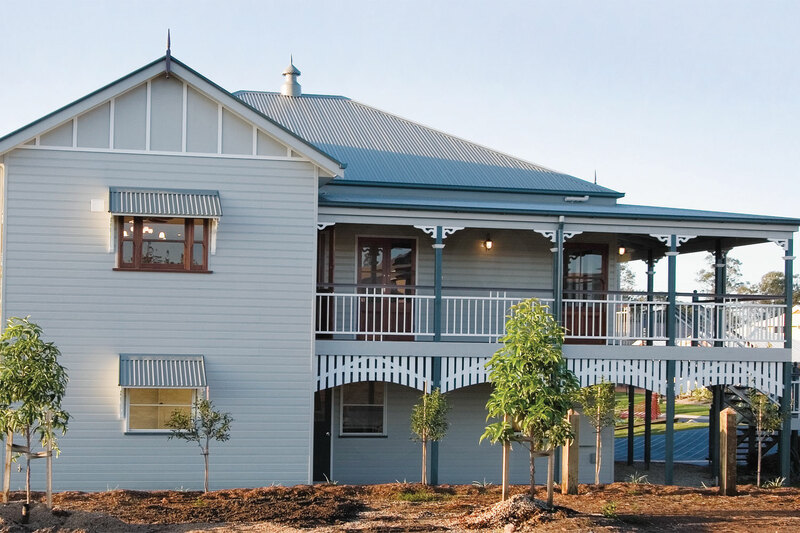 Alternatively, as the block sizes in new estates diminish, the Georgina, with its old-world charm and fetching façade, would perfectly suit any modern streetscape.The Georgina is one of many eye-catching designs fashioned by Garth Chapman’s Traditional Queenslanders. 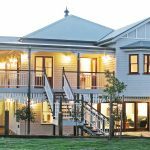 Angled timber stairs at the front provide access to an L-shaped verandah, which takes full advantage of outdoor family living. 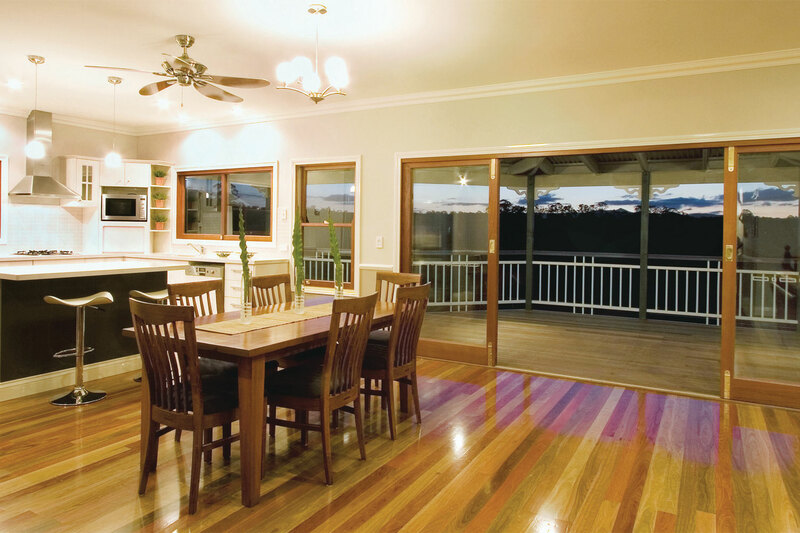 Surian cedar-framed French doors, double-hung windows and sliding doors blend perfectly with heritage colours — exhibiting a modern twist — colonial balustrading, decorative corner brackets and window hoods. A small bay window in the master bedroom creates a visual highlight on the façade. 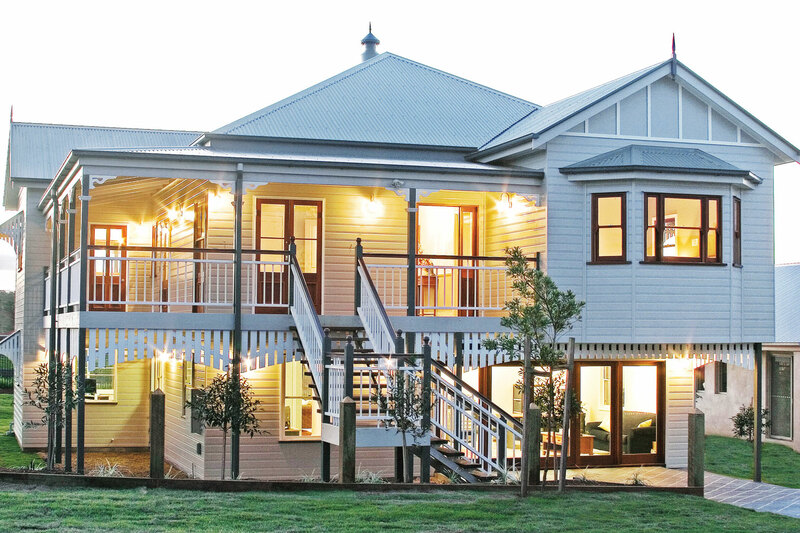 Lifted high on steel stumps topped by curved timber skirt battens, the Georgina promotes the classic beauty of a Queenslander home. 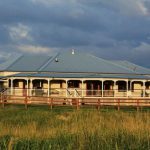 Inside this well-crafted abode, mixed-hardwood timber floors team with delicately carved breezeways, colonial arches and dado rails to show off the preference for quality living with a heritage feel. 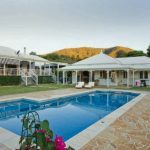 Families who love large gatherings will find the full-length, covered rotunda at the back to their liking. A servery window in the kitchen makes food distribution a breeze. 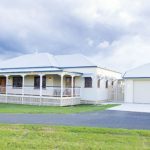 The corner kitchen, with its vinyl-wrap VJ-profile cabinetry, Smartstone benchtops, walk-in pantry and island bench, is more than adequately equipped to service the spacious family/meals room, study and two bedrooms upstairs. 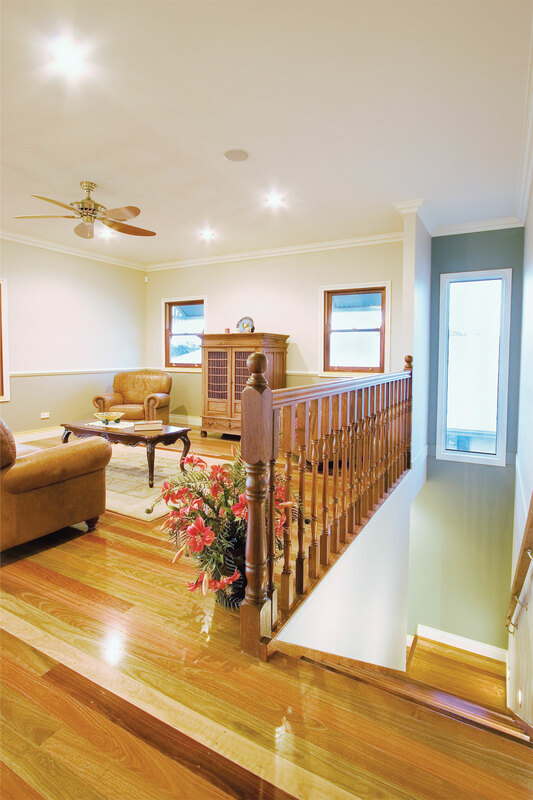 Attractive turned-timber balustrading introduces the steps, which lead downstairs. 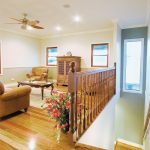 Overhead is a slender fixed window that throws appealing light onto the passageway down to two more bedrooms, a bathroom, rumpus/media room, a laundry, plentiful storage and two-car accommodation. 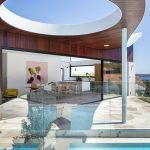 Underneath the upstairs rotunda and flowing out from the rumpus room is a sandstone-tiled verandah, adding another venue for alfresco living. 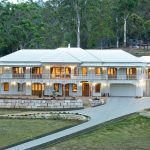 With the current focus on sustainable development and energy efficiency in a tropical climate, the Queenslander-style home seems to be an answer that doesn’t require a reinvention of the wheel. 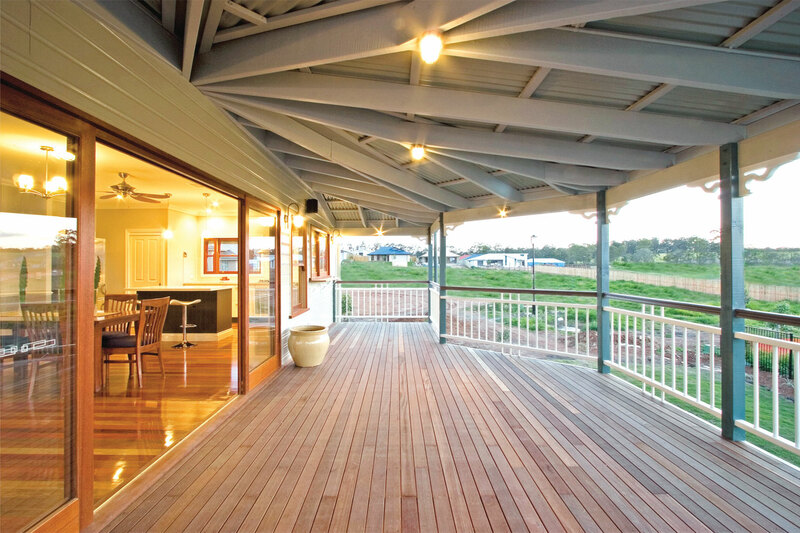 The standard features of a Garth Chapman-inspired Queenslander include insulation in all external walls and internal ceilings, wide verandahs, window hoods, eaves, breezeways above bedroom doors, light frame construction, natural ventilation and high ceilings. 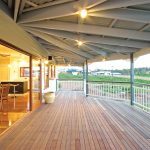 The Garth Chapman design team will then individually modify the designs to minimise the effects of the summer sun, maximise the benefits of the winter sun and take advantage of any prevailing breezes. 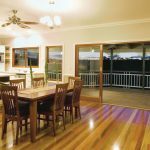 These attributes ensure your home will be cool in summer and energy efficient. 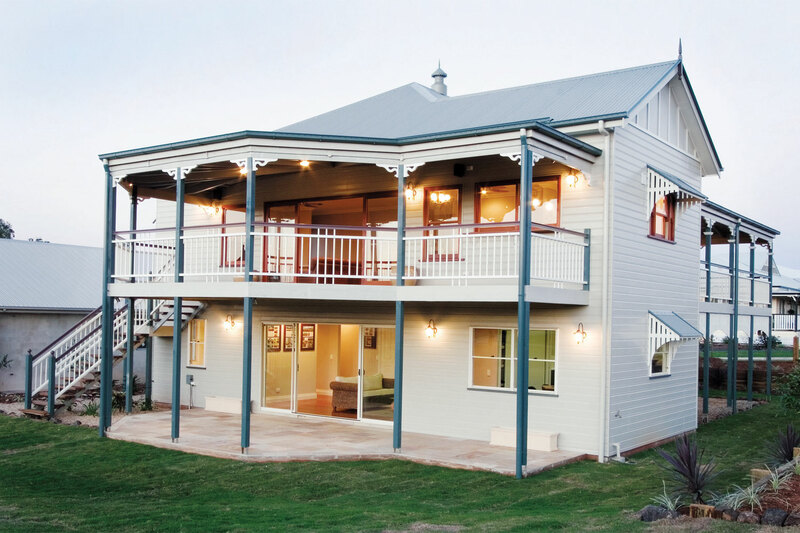 Garth Chapman’s Traditional Queenslanders is a multi-award-winning group of individual, authorised builders consistently taking out many Queensland Master Builders’ heritage home awards since its formation in 1988. 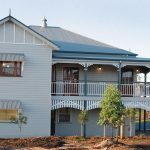 The company is renowned for inspiring the faithful reproduction of traditional Australian architectural homes with all their stylish attributes. 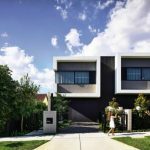 These magnificent homes are distinctive in design and perfect for the Australian climate.